Four Constangy attorneys have been honored with inclusion in the recently released 2014 Georgia Super Lawyers publication. 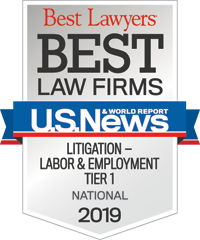 W. Melvin Haas, III, partner and head of the firm’s Macon office; Frank B. Shuster, Atlanta partner; and Neil H. Wasser, partner and chairman of the firm’s executive committee, were all selected in the Employment & Labor category. Kelli P. Hill, associate in the firm’s Macon office, was selected as a Georgia Rising Star for Employment & Labor. Only five percent of attorneys receive Super Lawyers honors each year. Attorneys are selected based on the quantity and quality of nominations they received from other Georgia attorneys.